Part of Water Quality Set - Buy all four books and save over 30% on buying separately! 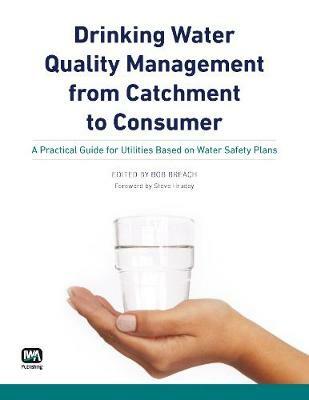 Drinking Water Quality Management from Catchment to Consumer is a best practice book that builds on the experience of water suppliers and experts across the world in order to provide a practical guide to help utilities improve the management of drinking water quality. It is based on the Water Safety Plan approach and the principles of the Bonn Charter for Safe Drinking Water, and is intended to complement and support other relevant publications particularly the WHO Water Safety Plan Manual. It has evolved from the work of The Bonn Network which is a global group of water suppliers originally established to develop and share best practice in drinking water quality management based on the Bonn Charter. The emphasis is on practical information "by operators for operators", learning from the experience of a range of water suppliers across the world. The book supports and encourages users to think through the best way for them to improve drinking water quality management taking account of local factors. It recognises that whilst water suppliers are central to the provision of good drinking water, this has to take place within a broader legal, institutional, and financial framework which is the responsibility of Government and others. It thus highlights the ways that water suppliers can work with a range of partners to ensure that all are committed to the same goal of good safe drinking water. Drinking Water Quality Management from Catchment to Consumer is an essential reference for water quality, laboratory and operational managers from water utilities around the world. It is also helpful to consultants working in this area and regulatory, health and municipal, and catchment management authorities. The book is of interest to academics working in the field of drinking water quality, and risk management and may be used on any courses aimed at managing drinking water quality.